The Fall Harvest Trifle is a neat spin on the traditional cake recipe. Its soft layers of fluffy pumpkin cake, sweet vanilla custard, and cinnamon sautéed apples topped with whipped cream would be the perfect treat to make for family and friends this holiday season. In honor of National Cake Day this Nov. 26, give this sweet and simple cake recipe from the Red Brick Bakery a try. Combine sugar, eggs, salad oil and pumpkin in one bowl. Sift your dry ingredients into your wet mixture and mix thoroughly. Pour mixture into a greased 8-inch square pan. Bake at 350° for about 25 minutes or until a toothpick inserted in center comes out clean. Combine milk and 2 ounces sugar in a small saucepan. Bring mixture to a simmer over medium heat. In a separate bowl, with a whisk, combine the yolks, egg, 2 ounces of sugar and cornstarch. While continually whisking, gradually pour the warm milk mixture over the egg and cornstarch blend. Once combined, pour the entire mix back into the saucepan and cook while continually stirring over medium heat until thickened. Transfer to a bowl and add vanilla and butter. Place plastic wrap on the surface of the custard and allow to cool to room temperature, then chill for further use. In a medium sauté pan, melt butter, and then add the apples and cinnamon to pan. Sauté over medium heat until fork tender. Remove from heat and cool for future use. 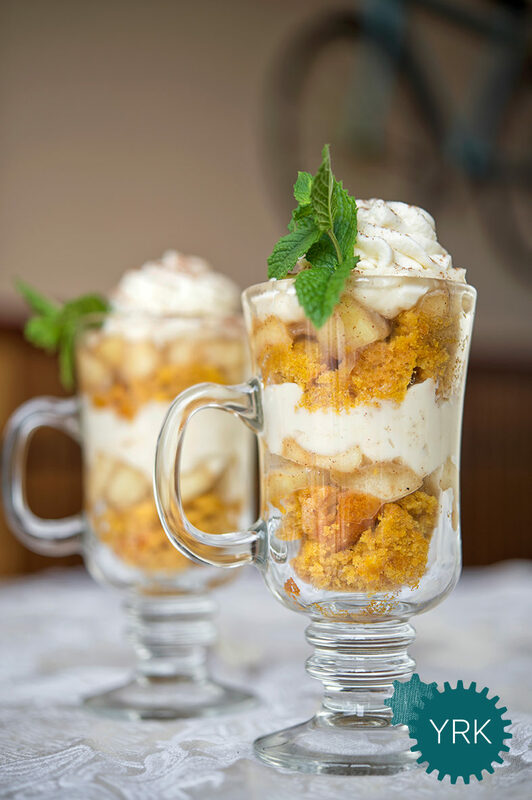 Layer cubes of pumpkin cake, cinnamon apples and pastry cream in a glass of your choice. Top with whipped cream, cinnamon and fresh mint.